Relentless are running a War of the Roses style format event with cash/product for tricks in North Berwick on the 14th of April. 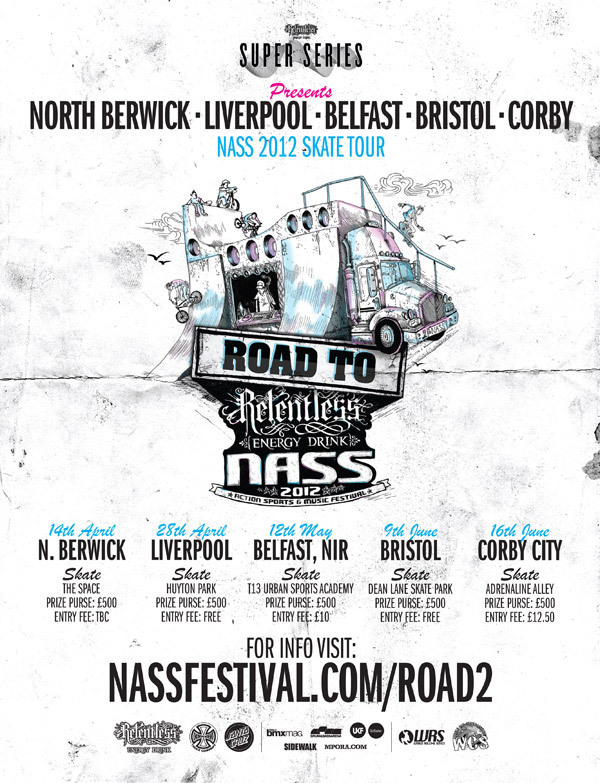 Relentless Energy Drink NASS 2012 today announces a 5 stop tour to celebrate NASS in 2012 and we are stoked to announce Santa Cruz and Independent Trucks as partners of both Road to NASS and NASS itself. NASS will be travelling the country bringing cash for tricks jam sessions to 5 spots in the UK. With Relentless Energy Drink putting up £500 per stop for the tricks of the day. Add that to Santa Cruz and Indy goodies and you’ll be swimming in product. Just show up on the day to enter. There will be pro and am categories at each stop. See times and dates in the table below. We will also be holding a video contest for filmers out there. Come down to any stop and put out an edit. Best ones will go into a final vote with the winner receiving a free weekend at NASS and the chance to work with the Sidewalk/NASS film crew. For more details visit www.nassfestival.com/sports/road_to_nass.